Well, tomorrow’s the big day. Steven Universe will complete its first twenty-six episode batch with a two-part bonanza. It’s going to be spectacular. We know there are twenty-six more episodes of season one and fifty-two episodes of season two coming. However, Cartoon Network initially ordered only twenty-six episodes. You can bet good money that Mirror Gem and Ocean Gem were written so that fans wouldn’t be left feeling cheated if the network declined to continue the series. So because of that, expect a lot of “whoa” and a fair amount of “holy crap!” Cartoon Network has been running a lot of commercials for the special event, so we can make some guesses. There has also been a leak to help us too. If you’re a brave sort when it comes to spoilers, check out our expectations for the episode starting a few paragraphs below. If you want to see the episode yourself before you come to the lore mill, then a word on scheduling: after the episode airs we’ll publish a reaction post which will be completely spoiler-free except for some vagaries (it would say things like “we have enough to start a page on Gem culture now!” or “looks like there’s something else for the Technology page”, and there will probably be a “believe the hype”). As usual Friday will be a day off regarding Mirror Gem and Ocean Gem while we process everything, then Saturday will go more in depth on what we’ve learned and Sunday will speculate about what the still-ambiguous stuff means. Ready? Spoilers below. Ye be warned. Click “Read More” only if you mean it. Steven Universe will continue coming back strong from its long hiatus by airing House Guest on Thursday, Oct 2, 2014. It will air at 6:45 PM EST rather than the usual 6:30, in what looks to be a permanent schedule change. This one was too good not to share. 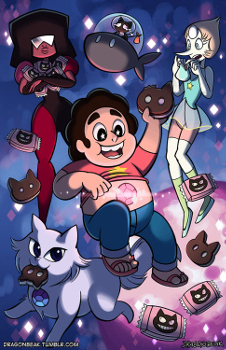 Who doesn’t love Cookie Cats? Lion Lickers just can’t cut it. Check out DragonBeak’s Cookie Cat in its full-sized glory on Tumblr! Aivi and Surasshu have posted Rose’s Fountain (1:02) from An Indirect Kiss. It does indeed sound a lot like this week’s featured song: The Hill,which makes sense considering the heavy association both of them have with Rose Quartz. In honor of Rose Quartz’s heavy involvement in An Indirect Kiss, this week’s selected song is The Hill, from Lars and the Cool Kids. This song seems to be Rose’s theme, and was also featured in extended form in An Indirect Kiss when the fountain was restored. All times are EST and PM. What could An Indirect Kiss mean? As we saw in yesterday’s post, An Indirect Kiss was rather heavy with potential implications for the lore of Steven Universe. Unfortunately, it looks like it’s more of an episode that sets us up to recognize answers hinted at later in the series rather than one that gives us any. Amethyst glitched out as her gem was damaged, almost like a malfunctioning projector or computer screen. We know from Ms. Sugar that the Gems have no gender and don’t reproduce (Rose giving up her physical form to beget Steven being the sole exception), so this means that Gems could be artificial creations; much as the Gems used the gem shards shown in Frybo before they rebelled, Gems could possibly be the leftover creations of a dead civilization. That’s all wild speculation, though; it’s something to watch out for as the series progresses, but it’s really “out there”. We know that we’ll learn more about the history of Gemkind as the series goes on, hopefully a lot just in the next two episodes, but we might never get an origin story for them. We’ll just have to keep reading between the lines, and see what we can see. Rose’s role as leader also came up. If the Crystal Gems have become directionless without Rose, though, what were they working towards before Rose decided to replace herself with Steven? Why did Rose decide to do that? She can’t have come to the conclusion lightly. Steven the Swordfighter and Lion 2: The Movie have both referred to Steven having a destiny. The best guess as of right now is that Rose wanted Steven to heal the monsters, as he does seem to be better at it than Rose ever was, but we still don’t know what happened to them in the first place. However the monsters get healed it won’t be with Steven’s healing saliva; if the saliva were enough, Rose could have just used her tears. Rose’s tears were enough to restore the bramble creatures, however. It’s possible that whatever is hypothesized to have reduced the majority of the Gem population to monsters worked its magic elsewhere, and Rose used her fountain to keep the brambles in their natural, peaceful state. We know that the Gems have fought monstrous non-gemmed creatures before (the giant bird mentioned in Cheeseburger Backpack wouldn’t have had any reason to lay eggs if it were a gem creature). It seems more likely, anyway, than Rose’s “healing tears” changing things from what they are “meant” to be (though it’s also possible that, martial side on display again, Rose cultivated potentially dangerous plants as a dead man’s switch to booby trap the fountain should it ever fall into disrepair). They can cure Connie’s eyesight, but only up to regular human ability. How powerful was Rose exactly, though? We know she was an inspirational leader, and apparently quite skilled with the Gems’ magical technology, but could she have had even more powers that set her apart from the other Gems? Amethyst attributes Garnet’s leadership status to her extrasensory perception, so it’s not a stretch to assume that Rose would have enough powers to put her over Garnet in Amethyst’s eyes. An Indirect Kiss gives us an interesting look at what happens when a gem is damaged, takes us to another new location, makes us wonder about Steven’s purpose, gives us something that might have crucial lore implications, and adds another power to Steven’s slowly growing list. As far as impact goes, this episode is long on speculation fuel and short on hard answers, but that’s alright: that’s how we like it around here. Amethyst’s gem is cracked by a simple fall onto a rock. While she fell very far and so would have hit the rock with a lot of force, her body has withstood far more force in the past without any trouble at all. Much more delicate than the illusion of a body it was projecting, the gem started to malfunction as its damage progressed. First only Amethyst’s appearance was changed, then her speech came out garbled, then her entire form became nonsensical (accompanied by some computer-glitch visual effects during the shift), and finally she seemed to be dying as a human might. All in all, this makes computer metaphors easier to use to describe Gems, but it doesn’t look like we’ll be able to fully appreciate the meaning of this all yet. Rose’s Healing Spring, described by Pearl as “Rose’s most precious sanctuary”, is the second big location we’ve been shown that is associated with Rose Quartz. Unlike the Quartz Cave from Lion 2: The Movie, the other Gems know about the spring. Like most Gem locations, and also unlike the Quartz Cave, the spring is a place of great beauty once restored, and overflowing with magic. Most interestingly, while immersed in his mother’s tears, Steven seems to see the statue bending down to offer a hand to him, though the episode doesn’t go anywhere with it and Steven doesn’t comment on it. Again, a subtle indicator that when characters say that Rose “gave up her physical form”, it doesn’t mean the same thing as death. Pearl, having something of a meltdown due to the fountain’s rundown state, mentions that the brambles infesting it are “a mess without [Rose’s] guidance—directionless, pathetic clinging things” while clinging to Garnet. We’re clearly meant to understand that she’s projecting her own insecurities onto the brambles. Are the monsters not the only corrupted things out there? The brambles didn’t just provoke Pearl, though. They were able to come to life, intelligent enough not cause trouble in the presence of Garnet and Pearl, and were restored to being beautiful and peaceful once the fountain of healing tears began to flow and the tears ran over them. We’ve already seen heavy implications that the monsters used to be humanoid Gems just like Amethyst, Garnet, Rose, and Pearl, but we’ve been short on non-gemmed enemies. Finally, Steven’s saliva can heal now, as it did Connie’s eyesight. It’s the first time we’ve seen Steven definitely inherit a power from Rose that wasn’t typical of all Gems (his ability to summon a weapon, and his ability to shapeshift), though it’s possible that Rose could also heal in a different way without her tears, as Garnet instructed Steven to try in Monster Buddies. Mirror Gem will be airing on September 25, 2014, followed immediately by Ocean Gem.